Here, a revolutionary concept has been introduced to the market: a POLIMAT palletiser feeds bag stacks to the Ventomatic® Flying Fork-Lift FFL, which automatically loads them directly onto trucks without pallets (Figure 4). This greatly simplifies the logistics, and reduces bag dispatch costs. Moreover, it allows the loading of trucks at the same capacity as the palletiser – in this case, 3600 bags/hr. Space required for the installation is also limited and storage space is minimised, as bags can be directly loaded without passing through the warehouse, solving the challenge of optimised bag dispatch on a limited plot of land. This palletiser/loader combination also enables the plant to operate continuously, as trucks are loaded when present in the loading bay and the palletiser is used when no trucks are present. 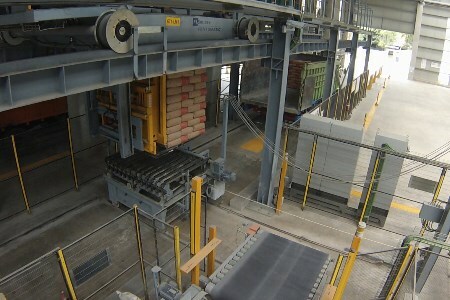 The palletised stacks are then moved by a forklift to storage using slip-sheets. "Loading in Lampung: Part 2"
100% packing line availability (regardless of trucks’ presence). Highest dispatch flexibility and speed thanks to possibilities of direct loading to trucks, warehouse storage, or loading from storage to trucks by traditional fork-lift or Ventomatic® Flying Fork-Lift FFL. Elimination of empty pallet logistics and costs. Trucks with side walls can be loaded (impossible with traditional fork-lifts). Minimal infrastructure needed as the equipment is installed on the ground floor. Another interesting feature is a bag splitter, which divides the bag flow between the manual loader and the palletiser. This way, the line always operates at full capacity, even when small vehicles are loaded manually, as the excess capacity from the packer is sent to the palletiser. The solution offered would not be complete without an advanced plant supervisory system. The operator in the cargo control room can constantly monitor the smooth operation of the Lampung terminal thanks to the Ventomatic® Plant Supervision System. The status and conditions of each and every piece of equipment installed is shown in real time and messages are automatically displayed in case of deviation from normal operation. The supervision system also allows FLSmidth Ventomatic® Technical Assistance to remotely access the system in the unlikely case that troubleshooting is needed. PT Holcim Indonesia Tbk. and FLSmidth Ventomatic® have successfully partnered to set up a state-of-the-art cement terminal in Lampung, Sumatra. As a ‘One Source Supplier’, FLSmidth Ventomatic® has designed, engineered, and delivered a solution that matched all requirements of PT Holcim Indonesia Tbk., particularly optimising cement dispatch on a limited plot of land. The system supplied offers flexibility, reliability and high efficiency at reduced costs. Its design allows the loading of any kind of truck, while allowing dispatch capacities of up to 3600 bags/hr. In an increasingly competitive market, the Lampung terminal provides PT Holcim Indonesia Tbk. with an advantage, keeping operating costs low and attracting customers thanks to its new cement dispatch system. This article first appeared in Cement Plants of the Future. Read the first part of this article here.